One of my friends, Kenny, always teases me that no matter where I go my desk always looks the same; in other words, it is always laid out the same way. And he’s right, but there’s a good reason for that: it works for me. One of the parts of that system-that-works-for-me is a small collection of reference books that I always have to hand. At home they are on a shelf next to me, at work they are on my enormous desk. 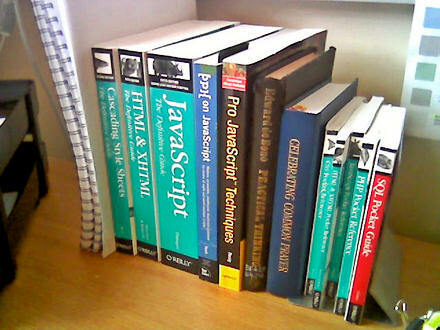 At the moment the least used of these are the SQL and PHP Pocket Reference guides, and the most used are the Definitive Guides for XHTML and CSS, and since I’m debugging code for a website launch Celebrating Common Prayer is also getting a look in once or twice! 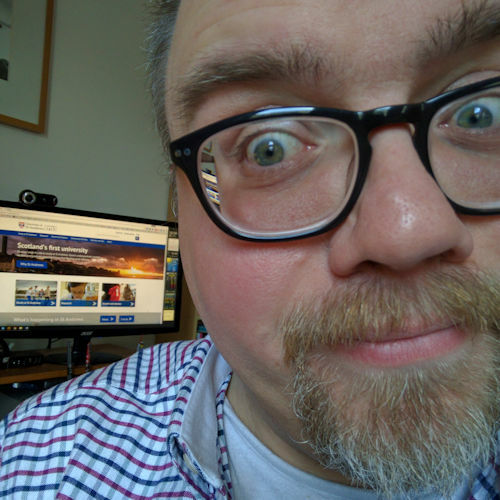 Mostly Scottish Episcopal Church books — Code of Canons, liturgy, and the Red Book (contacts) — a bible (NRSV) and Revised Common Lectionary, an English dictionary and thesaurus, a copy of Getting Things Done and two copies of the Visual Quickstart Guide for WordPress 2. So now you know! What are your close-at-hand books of choice? 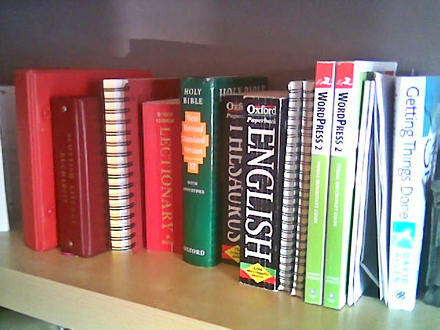 On the book case by my computer, there are different technical volumes for computer software, the Daily Office SSF, an NRSV, the Message Bible and most hymn-books known to the Church of England and Scottish Episcopal Church! Crockfords, a dictionary and a thesauraus are shared and live in a different room! and The Oxford Medical Dictionary. Sorry. Dull. I have only just noticed that Oxford has managed to take nearly all of my money, what a bummer! ‘The Dawkins Letters’ by David Robertson. Better, and non-medical which is always nice! All sitting on top of the fire next to my desk with my digital radio atop the phone directories and my scanner at the other end. And above them all the most wonderful framed poster of the Duomo di Siena. As for the 2 desks… well they could probably do with a little bit of a tidy. Also a book called A Hard Days Write – a Beatles book about the origins of their songs. Aside from that there’s only my 24 DVD 5 season boxset and loads of free space. Seeing a copy of GTD by David Allan on your shelf, have you had a look at/opinion of the Thinking Rock software? Or perhaps it would not fit into your combination of Outlook and Psion software? Did your idea for a feature in your favourite software surface yet? In response to “Scottish Roundup” I tend to use electronic bible resources more than a physical bible book, as I find it quicker to look up; besides copy and paste is quicker than copy, remember and type. My favourites are e-Sword and Nelson’s Ultimate Bible Reference, which is a Libronix product and has the NRSV, which e-Sword lacks. I also use the PDF version of the Revised Common Lectionary (which gives the readings for every Sunday and major festivals). I have no books on my desk (I currently have no fixed abode at work). My desk at home is also no longer. However, my bag (as a good metrosexual, I have a bag with me most of the time, even when walking the dogs, but that’s only to pick up…anyway) features a v handy edition of the New American Standard Version that my Dad passed to me. I enjoy reading ink on paper, don’t hold that against me. My Diary and My Journal also make a regular feature in said bag. I don’t have close-at-hand books….I have my entire library at home and only the Jerome Biblical commentary at work….